New Directions Publishing Corporation, 9780811213509, 192pp. 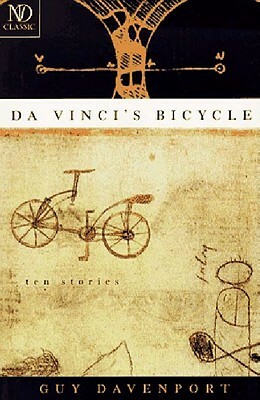 Da Vinci's Bicycle, Guy Davenport's second collection of stories, was first published in 1979, and contains some of his most important fiction. Written with tremendous wit, intelligence, and verve, the stories are based on historical figures whose endeavors were too early, too late, or went against the grain of their time. They are all people who see the world differently from their contemporaries and therefore seem absurd, like Pablo Picasso in "Au Tombeau de Charles Fourier," Leonardo Da Vinci in "The Richard Nixon Freisch tz Rag," James Joyce and Guillaume Apollinaire in the marvelous "The Haile Selassie Funeral Train." Hilton Kramer of The New York Times has said, "Davenport's conception of the short story form is remarkable. He has given it some of the intellectual density of the learned essay, some of the lyrical concision of the modern poem--some of its difficulty too--and a structure that often resembles a film documentary. The result is a tour de force that adds something new to the art of fiction.